Do you have an extra sheet of kitchen foil? Then you have the perfect palette for your child’s process art exploration. Sure, you usually use the shiny stuff to wrap up leftover, line your baking pans and keep the kids’ lunches in place. But, this time you can use it for an artsy adventure! Kitchen foil and wax paper are two of my favorite inexpensive paint ‘trays’. They provide pretty effective barriers to keep whatever mess your child is making off of the table. If you’re already using a piece of foil for your child’s art activities, don’t let that leftover paint go to waste. Instead, keep it out and let your child experiment with it. How? 1. Pour the paint. If your child isn’t already crafting, pour at least three colors of paint onto the flattened foil. You can use any colors that you want or go with a primary mixing exercise (use red, blue and yellow to mix green, orange and purple). 2. Let your little artist mix the colors. She can use her finger or a paintbrush. 3. Explore how folding the foil changes the paint. Fold and unfold it or crinkle the foil together. 4. Flatten the foil again. Draw designs into the paint. Your child can use her hands or the end of the paintbrush to do this. 5. Press a piece of paper on top of the paint to make a print. Eventually the paint will turn into a brownish hue that’s none too pleasing on the eyes. But, your child is having fun – so, that’s all that matters. Keep mixing the paint, drawing in it and printing until your child has made enough discoveries for the day. Then start over again tomorrow! Are you looking for more process art for kids? Follow my Pinterest board for ideas! 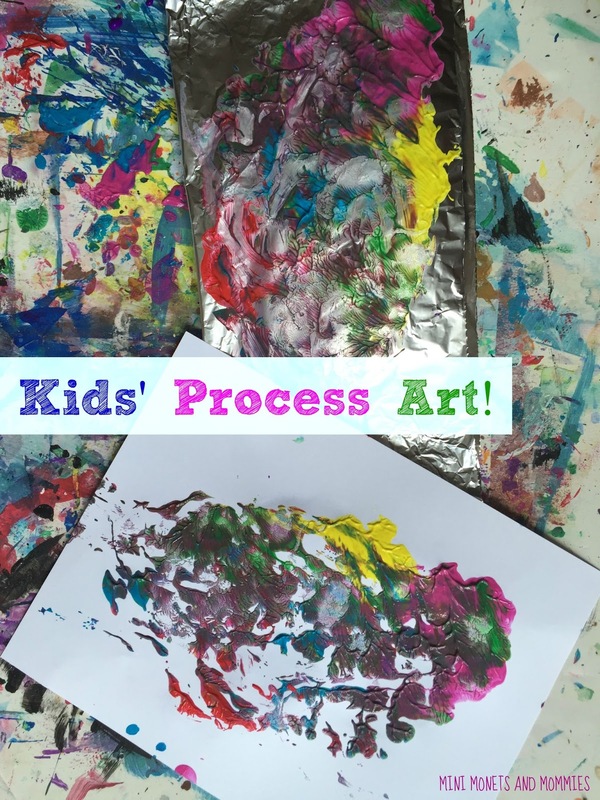 Great idea to use foil for process art! Thanks for sharing at #ToddlerFunFriday! What a fun project. I love how it incorporates so many different senses at the same time! Cute! Great way to keep the pain contained too! Thanks for linking up on #ToddlerFunFriday!